How many of you are guilty of going to brush your teeth before bed the first night on vacation and you find out that you left your toothbrush at home?! Trust us, we know the feeling. Sometimes there isn’t one available at the front desk; sometimes it’s too late to go out and buy one; whatever the reason, save the stress – let us help you prepare for your next vacation! 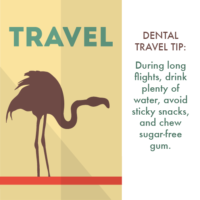 Oral hygiene is an essential part of your day-to-day routine and while packing for your next trip – deciding what outfits or gadgets to bring – sometimes we overlook our daily necessities. Don’t be that person! On top of your dental needs, we’ve supplied you with some additional items that are neglected but have saved our lives while traveling! We’re all guilty of forgetting a toothbrush and tooth paste which is a pain in the neck. But we all know that we eat A LOT during vacation so we always want to encourage saliva production keep our teeth refreshed. We can do this by drinking water after meals and chewing sugar free gum! If you’re one to not like getting water from your room, make sure to carry a water bottle to fill wherever you go, on the go! For some non-tooth related items, be sure to add eye drops, baby powder, and baby wipes to your bag! Hotel rooms can be stuff and often times we get extreme lazy eyes the morning after which can be spruced back to life with some eye drops! And ladies, how many of you get oily hair after sleeping? Adding baby powder to oily areas on your scalp and massaging it in will refresh you hair to be picture-perfect ready! Don’t forget about baby wipes – when out and about we’re exposed to a lot of germs. Sometimes hand sanitizer can leave headaches so instead, opt to using baby wipes to clean off yourself of any residue you may obtain! Traveling can be made easy should we not overlook the small stuff. These items can go a long way into making your travels pleasant! Do you have any more tips we didn’t include? Share with us below!